ER (TF) bounced on 405 which indeed is a significant support level as mentioned yesterday, and selling pressure seems like abating in the short term. Dynamics have however reversed and stronger support is likely to be needed in the 380 area. ES also bounced on equivalent (actually stronger support) on 781, and should also settle lower by the end of the week. Targets are again 766, 750 then the high 720s. No change in our longer term scenario: we still assume the bottom is behind us in our trading plan. NOTE: From now on, unless our indices should substantial decorrelation to warrant analyzing specifics, we shall write a single report for both. We can clearly see that the retracement we anticipated started Thursday night, and carried on pretty steadily. 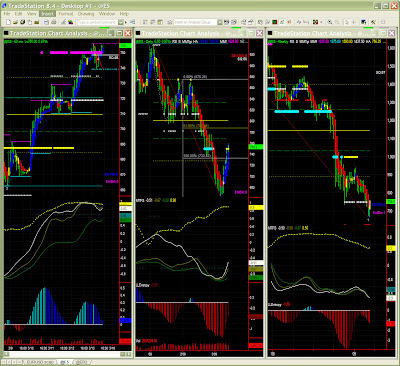 Very easy to follow on the 60mins charts. ES broke Fib PR1 and PR2 to now sit on the 76% retracement level which is generally regarded as weak (not to be discarded though). MTFS is oversold so a short term bounce is quite possible even if it is clear that the reversal is now too well engaged to the true support level has to be lower. ER (TF): selling pressure seems more constrained. ER (TF): same situation with targets being 410, 392 and quite possibly the high 370s. The early signs of recovery we detected last week are more visible, but at the same time, also show indications of the "early crossover" pattern, in other words a choppy recovery at best, and a pattern failure otherwise. We still gear towards a reversal over the longer run, so longer term players may want to look at favourable entry points if they are not long already. We still assume recent lows represent the absolute bottom. The "possible bounce" will certainly not happen. ES and ER are really bullish and their targets given yesterday have already about been hit. ER: the 437 pivot level has maybe been penetrated on account of high volatility but it could still hold. We personally can't quite see ER (TF) reach 468 without a retracement, yet the main guideline has always been "go with the flow" so why complain now if bars stay blue... We know this will stop soon, but let's enjoy the ride so long. We would like to see 812 being now tested as support for prices to go higher (846?). Late buyers have to be cautious though. The retracement we expected came quite suddenly yet remains limited if we look at the average range on the daily chart. ES is still blocked on the major resistance level trying to go higher and it looks like it could break it to unleash some energy to reach Fib PR2 in the high 830s in the next couple of days. Again the overall look on daily and even weekly leads us to think the bottom is behind us but a substantial retracement (750?) is in the cards still, so buyers will have a better entry point by the end of the month. ER (TF) follows a similar path with a target in the high 430s then 446. 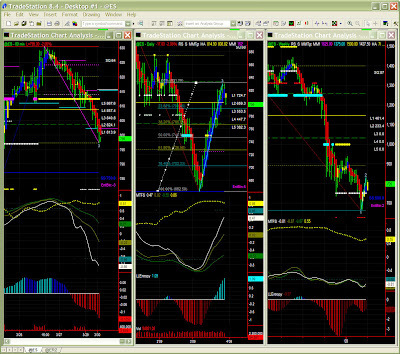 Retracement is also necessary here, so we'll update our scenario when we get closer to next pivot point. ER (TF) took a breather inches away from resistance level at ~437 to now retrace in the same high volatility environment. It is now aiming for around 405 (Fib PR1) or the following one right Friday's lows. As said in previous reports, we prepared for this retracement, and are watching out for a bull pattern formation on the daily chart. ES follows a similar path, and was actually ahead of ER, this explaining why it didn't quite reach its target. ES's rise has been stopped on strong resistance level around 812 to only retrace slightly. It should now hit a significant support level just below 800, yet, we have not the faintest indication of any substantial selling pressure, even if we can already preventively look at another strong support level in the low 780s. We believe buyers are slowly coming back to the markets, with due consideration that it may still take a few weeks to dissipate the accumulated 'bearish' energy. We indeed saw ER find support just below 400 to jump up to close to the strong resistance level. 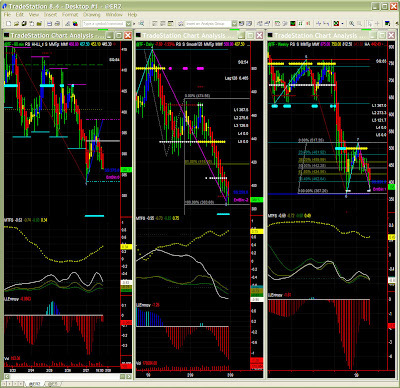 We can see a few salient levels in this area (see daily chart). Having said that, we still believe a cup & handle formation will be necessary at some point. Today's momentum can be sustained if ER stays above 421. Reached its target, and yet still shows some residual momentum above 812. ES is ready for a pause but could just as well try and reach the next target on the daily chart (~833). Having said that, we have to be cautious and prepare for some limited retracement. This bull run in any case takes away from danger zone (the failed recovery scenario), so we can estimate 750 as a new support level and potential stop for those who went long early enough. 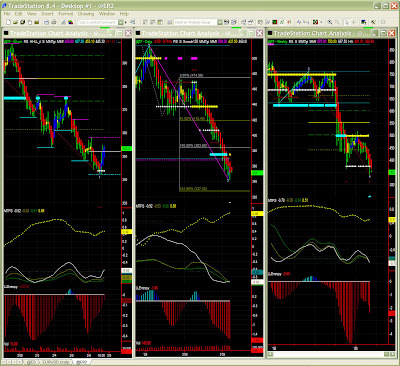 Similar picture here (see ES below), and clearer picture too. Swing quality is higher here, making chart reading a lot easier. The retracement now hit Fib PR2 in the mid to high 390s where it could bounce first. However, support on 390 and even 381 would be our natural target level. Same mild retracement, same pattern, so while some buying interest is now visible, we shall here as well look for a lower support level (Fib and/or MM). It is however not clear whether we will see 375 again. A number of market participants will now try and enter limit somewhere below 400. Having said that, we have to keep the same caveat in mind that here as well, the Cup&Handle formation could fail, leading to a downward Fib pattern with a target near lows. We can't discard that scenario even if we are aiming long. A stop level near lows makes it a relatively low risk/reward trade. Early signs of some weak recovery in the coming weeks. Having said that, too early to rejoice as one could also just as well hit lows again, and even lower (MM stall level is around the corner at 312). It is quite unlikely though, or at least not predictable at this juncture. Like for ES, long term risk adverse players should maybe wait a few more weeks to see selling pressure abate. Any long trade below 500 is a bargain anyway if we have a long term horizon. We finally got the much anticipated pause on our indices. It is never the most exact science, but it occured more or less on stall level on the 60mins chart, concomitant to salient Fib levels as well. 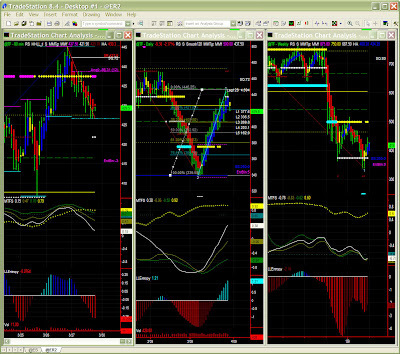 Healthy profit taking with a test of pivot level was bound to take prices to the low to mid 760s. While we're hitting support here, we could see a probable continuation to stall level in the high 750s or Fib level around 755. Obviously 750 is the ultimate test, but we cannot see at this point whether it will go that low. Looking at price segments, 781 is a test pivot level for a trading range 16 or 32 points wide. At the moment, we are below that key level, so we could well stay in this trading range. If/when passed, ES would in absence of exogenous factors return and stay in the equivalent price segment above. This 2% retracement on Friday remains modest compared to the run we've had in the last 2 weeks, and justifies a yellow bar only. Momentum is still up so we can only anticipate a limited pullback to the 750s level. While we are still in "early crossover" mode (aka failed recovery mode), this is likely to turn into a cup & handle formation still. Should selling pressure increase, we already see strong Fib retracement levels on 750 and 715 and targets just below 700 (unlikely scenario). Early signs of some weak recovery in the coming weeks. Having said that, too early to rejoice as one could also just as well hit lows again, and even lower (MM stall level is around the corner at 625). It is quite unlikely though, or at least not predictable at this juncture. Passage of time and a possible bounce could just as well help dissipate the strong selling pressure we've had in the last few months. I know a few of you trade shorter time frames taking in consideration the dominant trend from this context information. All I can say is to enjoy it while it's free. Not that i will necessarily sell it, but large projects can force me to stop this report like I already stopped posting forex information. ES is now engaged in a healthy retracement which could take it down to 750. While the channel is about broken, there is no indication of heavy selling though. In fact, to confirm our profit taking scenario, prices may even need to creep back to 781-783 to then go lower. Shorter time frames are recommended today and witching can also trick us a bit. On the daily chart, the retracement to 750 is also visible and probably anticipated but it is not confirmed at all so we might just be seeing a pause on resistance level for now. The market can indeed rest also. The weekly chart is also trying to show early signs of optimism and long term players may be looking for some good entry points. ER (aka TF) tells us a similar story, and we would like to see 406 to hold now. Otherwise, we'll check for a support level possibly as low as 375, to here again also help long term players jump in at a good price. If we look for possible exhaustion in this recovery rally, this is maybe not quite the time yet, but we should watch out still. 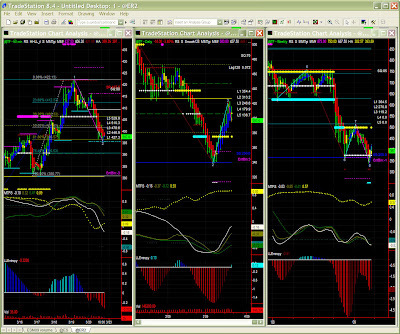 ES is creeping up and hitting our short term targets day after day to now come close to strong resistance levels. We do see a stall level around 805 with energy levels possibly peaking soon (we've hit 804 now). The pattern certainly seems completed. The daily chart is obviously looking bullish but also shows a strong resistance in current price area (high 790s). One should not read too much between the lines though. Again, the momentum is still there even if there is NO change in scenario, i.e. ES WILL have to retrace on this "early MTFS crossover". In the short term, we'll have to watch 782 as a support in case of a pullback. ER also has a little more room on the up side with a target on 421. Patterns are the same otherwise. 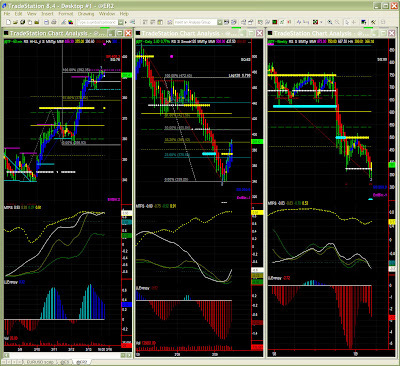 Continuation of the rally yesterday with targets now pretty close. ES could reach the high 790s and ER (TF) is now inches away from the strong resistance on 406. Obviously, longer time frames still point for some obvious profit taking but since we still have some upward momentum, it is difficult to pinpoint exactly when and where it will happen. We shall therefore watch carefully the 406 level for ER (and 421 should that one break, this is unlikely though). As said above, ES could still aim higher, so we'll check current highs and Fib level just below 800. ER stopped its rise almost spot on stall level just short on 400 to start retracing a bit. as mentioned before while resistance is just above 400, it is more important to see ER (aka TF) stay above 375. We realize that some profit taking will be necessary (early crossover on the daily chart and weekly chart still looking ugly). 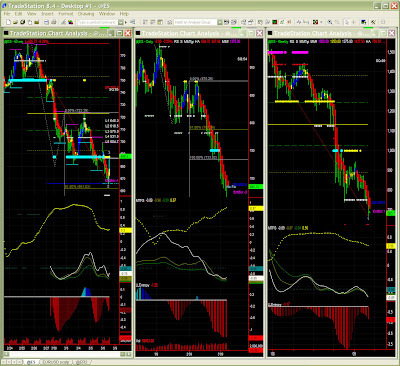 We'll therefore watch for Fib retracement levels on 60 mins chart and lower. However while energy level is dropping, we do not anticipate more than a modest retracement, so 375 would be the ideal target. Should prices stay above 385 (minor fib level, but a level still), ER may find the necessary boost to get to the low 400s target. ES seems to have bounced on 750, so could aim a little higher. We do have possible targets in the high 760s (hit already) and then high 790s. 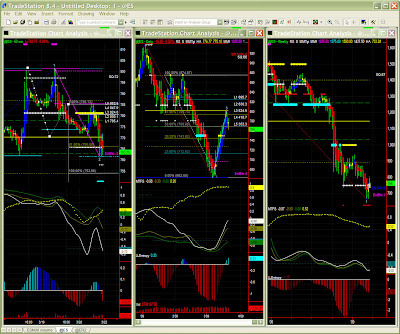 We know nevertheless that we have the same early crossover configuration here so a retracement is due. Bars are still blue, so we'll go with the flow until momentum is exhausted. This report adds to the ES report below, to which ER (TF) is largely correlated. ER reached Fib target in the low 390s and has little energy left here as well although it may try and reach stall level just short of 400 or even the strong resistance level on 406. ER has recently been lagging ES a bit, and both symbols should try and settle on their respective targets, hence we could see creep a little higher still before retracing. It would however make sense to see ER gather strength later on near 375. Same "early recovery" mode on MTFS here indicates some likely instability while comforting a turnaround even if it is bumpy. After all ER reached the 346 Fib target to then bounce to Fib retracement level on low 390s. As bars are blue (like on the 60mins chart) we have to assume that ER will try and aim higher before retracing, and here again, 375 would be a good support for a change in trend later on. This chart tones down any undue optimism here again. We need time to dissipate the accumulated selling pressure and we also need to see a strong support level level holding, otherwise ER will resume its course to 312. or even lower. We shall assume a change in trend is slowly taking place, so the same recommendation is valid to either wait a little longer to pick a good entry level. Obviously shorter term players would be long already with stops a little lower than recent lows as mentioned in previous reports (2 weeks ago already). More conservative investors are likely to first wait for 500 (salient Fib/MM level) to be passed and tested for support. We've had a good looking week last week, with a bounce on the 680s taking ES all the way up to 750 by Friday. This is a strong resistance level, so let's see what our charts tell us for the forthcoming days. As a reminder though, our charts are based on daily charts, and generally have a 2 to 3 day visibility with the 60mins chart providing us with more accurate entry/exit points and the weekly chart providing context. In addition, we all know that volatility tends to act as a "time compressor" hence requiring us to update our scenario more frequently. ES is now sitting on the 750 level, quite overbought with little energy to take prices much higher. One could therefore anticipate some retracement even if it is not quite visible yet. Since we always try to avoid reading more than our charts tell us, we will assume that ES will try and breakout on the upside after testing 750 for support. Energy levels being low now, We would probably need some exogenous factor to leave this area. Should this not happen within a day or two, ES will see some profit taking to the low to mid 720s. We seem to be in recovery mode and ES could even reach a Fib retracement level into the high 760s or even close to 800. We must however realize that MTFS is in "early recovery" mode, which is highly unstable, hence a retracement down is necessary to then provide energy to take ES higher. We must also take into consideration triple witching this coming week. Weekly outlook is still very bearish and this should remind us to avoid excessive optimism still. While the fall may stop ahead of the expected 625 stall level, we are likely to see prices below 700 again. Long term players shall therefore refrain from turning bullish too quickly. It is recommended to trade lower time frames or stay on the side line for the time being until all time frames are in synch. Having said that, it is clear that we start seeing bullish signs and there is a LOT of cash out there waiting to move back into equities, so it is more a matter of timing to pick to best entry levels now. Prices behaved as expected yesterday with some momentum left for ES to reach reach 730 and ER (TF) 374.50 close to our target 375 for the day. If stops have been moved up as we always do in such case, this last run must have been pretty good. Now ES is slightly retracing, with a moderate retracement potential to PR1 (703) first. The market is actually stalling right now but we'll have to watch price behaviour closely as energy comes back in. Although not visible yet, retracement could take prices all the way down to the bottom of the price segment (high 680s) which is a salient Fib + MM level. It must be noted however that on the Daily chart, signs of an early, bumpy recovery stat showing. ER displays similar patterns, and we'll watch for Fib levels there. The 1st Fib retracement pattern is already hit in the low 360s. ER (TF) could settle for a lower support level (357? 352?) but more interesting maybe is that here too, signs of a possible turnaround on the daily chart start showing. One may wait for a better entry point, but one should start thinking of trying a long soon with a stop just before lows (the more conservative ones should wait for confirmation early next week though). A good day yesterday... the bounce was anticipated in last reports and once 687 was broken on ES, we realized that ES would then evolve in the price segment above. Such price behaviour has also been discussed in previous reports. ES is now at the top of the new range (high 710s) and while it is likely to peak here (it is also a 50% Fib retracement level), it could reach 735 (Fib PR2) and eventually 750. That would be the rosy scenario without looking at longer term time frames. The truth is while the daily chart looks better (MTFS crossover + Entropy bottoming), it is likely to be quite bumpy and 687 could (and probably will) be tested again at some point. Even if the pace of selling may be abating a little, there is no reason to believe in a recovery in the short term. We might have an Up day today, but this contrarian trading should be restricted to lower time frames, and we'll watch 687-690 which a strong resistance area. On the 60mins front, we do have some mild support on current levels and the daily chart also shows a MTFS crossover indicating a possible short term bounce, but again, no chance of a change in trend any time soon. 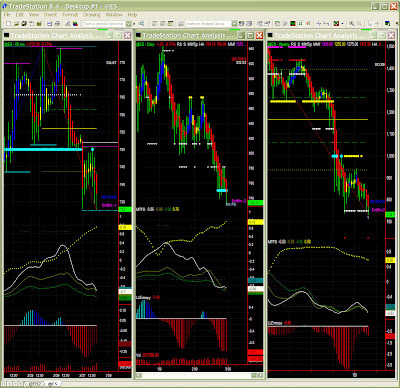 Here too, we seem to see some slowing down in selling, yet support is lower in the 656-661 area. Obviously, ES is correlated to ER and other markets, and therefore is also going south. Let's have a look at specific levels for this symbol. As mentioned on previous reports, prices try and stay in a given price segment, oscillating from volatility and noise, and only a change of referential, like news about rates etc tend to make prices shift. We are now in the [656-687] price segment and it is quite common to see the upper boundary being tested as a resistance. If so, ES will be sent down, which is the most likely scenario in the short term. Again, news can make the scenario quickly obsolete also. Target on the way down is in the [656-661] area, and should this fail to hold, we can already see much stronger support in the 620s. It is preferable to have all time frames in perfect sync, but while 625 is also a likely target here, the next "stop" seems to be just below 650. Again in times of high volatility, levels can be penetrated without breaking. Same story, and to be honest, we can't see what could stop ES from hitting 625 now. Markets have lost more ground last week, and to comfort the prevailing gloom and doom scenario, the Fib expansion pattern on the weekly chart has ... a negative XOP target price ! Short sellers obviously do enjoy causing a bit of panic, but let's try and be rational here. The fall has at least temporarily stopped on a MM level where we saw some bounce late in the day with a few short sellers buying back positions (very low volume though). Entropy also shows a potential bit of a reprieve even if stall level (~328) is now in sight and could be hit this coming week. In any case, there is no reason to change our scenario as long as prices stay below 375 (now strong Fib + MM resistance). Here too, MTFS is so oversold that one can only imagine a limited bounce for now. The same 375 level is key to any change in market mood and selling pressure remains so strong that even if some buying lifts prices momentarily, the Fib expansion target (high 320s) is likely to be reached within a week or so. While volume is good, one should probably see a high volume bar near Entropy bottom (not quite there yet) to announce a potential reversal. The comment above is a bit of a joke, even if mathematically possible. Having said that, one can't see what would stop ER from touching stall level on low 310s within a few weeks. Only a quick late short report today... sorry about that. One can actually refer to previous posts below as we are still in the same configuration. In the short term, we'll watch the 687 resistance on ES which is un der pressure even though we should see more selling down the line. ER is on a Fib expansion target no1, so could retrace upward a bit, again with no chance of a change in overall trend for the time being. Stopping the bloodshed is already a relief. ES is leading the way though, and over the longer term, the same feeling is that the bottom is still lower (339 on ER ? 645 on ES ?). More details on the next weekly report. I gave yesterday some information about price jumps (quantum leaps) and this current volatile provided a good example of such move in just one day. Prices indeed bounced from the support level in the high 680s (687) to the high 710s (719 to be exact), i.e. the 31 to 32 point range i mentioned previously (this value actually hasn't changed in the last 6 months at least). ER is on the same boat and tested the already discussed 375 level again. Markets could be cooling down a bit, at least temporarily. On the longer term, there will be that indecision or debate about 375 being either broken opening the way to lower lows, or Monday's lows only momentarily penetrated (or strectched) under the effect of volatility. I won't give an answer now, but to give credit to the latter scenario, prices must creep back above 375. Full stop. A fall like this one comes in waves, not Elliott and the like, but rather lines of defence being smashed one after the other. Prices indeed always try and find an equilibrium level in quantum leaps. So now, in absence of clear Fib pattern, except for some possibility of a target ... near 330, we just estimated where the next wall will be, and it is around 31 points lower than the previous one (375). This means we could still see more bloodshed. Sellers however generally pull on brakes 7/8 of the course, so we could see another attempt to break the fall in the high 340s. While dynamics are obviously similar, ES has reached its short term target given yesterday (687.5). Here also we have the same quantum jumps which could eventually take prices all the way down to 625, but let's first give this support level a chance. Again NO chance of recovery in the short term but stopping the pain would already be beginning of healing for some. We anticipated that selling pressure would take prices lower, but we though 375 would be strong enough to hold. Was that an effect of volatility which as we all know can force prices to stretch a support level. It seems we haven't quite reached the floor yet, so those looking for an entry/exit point here should switch to shorter time frames. Others can stay short and count their pennies, as bargain time is coming (don't get me wrong: it can take a few weeks to a couple of months or more). It's going to be a very bumpy recovery, but markets are really really cheap these days. After ES broke 750 to then test as a resistance level, we know things would look a little dire. We're now on our target around 730, but is there anything to lift our spirits now... ? Same picture here. Obviously we may hope that ER being a little behind, the fall will stop when/if 375 holds (that would equate to the high 710s here). All we can say that ES is immensely oversold and a bounce is always possible, without hardly any chance of reversing the trend in the short term though. Same sinister outlook. Are we really aiming at 625 now ... !?!? Oh well, there is still a support on 680 on the way. Our scenario last week proved right. We are now indeed about to test lows again and... no indication of a double bottom in sight. Let's look at our charts more closely. We don't have a tremendous selling pressure here at this time frame. Not to say that we're not bearish but we could see some support near or on the 375 level. No recovery in the near term, but we'll watch for a bounce as we get close to our anticipated support level. Same picture here. However the support level provided by MM stall level, Fib target and the strong 375 level may prove solid enough to exhaust sellers this week. Having said that, MTFS and Entropy do not show any indication of a forthcoming reversal. Almost depressing in a way... While we may still see some kind of a double bottom, it will at least take a few weeks to reverse the current bearish pattern. Selling pressure is no way as strong as the first bottom though.